Join the discussion on our forums! Come discuss Ghastly Conjurer over in our dedicated Ghastly Conjurer discussion topic. it might help quest mage a little bit with a cheap spell and a bit of damage migration. This card would have been a lot more usable as a 3/5 instead of 2/6- 2 power just doesn't pose that much of a threat to other minions, and lack of taunt makes the 6 toughness less valuable. It's mediocre- not horrible, but not effective enough to be good. Average card, giving you an average card. Budget Tempo Mage or Quest Mage if that becomes viable. Cool card but not super exciting. It's good for mages to have a decent defensive option but it's nothing super impressive, which I guess is why everyone's saying playable instead of very good. this card will definitely see play in quest mage, its defensive and quest helper. 6 hp is fine too, it can trade with small stuff. I will say I am highly biased against mage but we will see how this plays out. Cool. 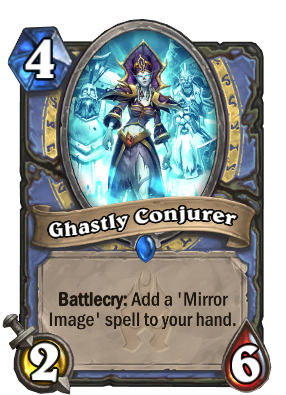 Now we don;t have to put mirror entity in our deck and can replace it with a nice minion. No, Mirror Image and Mirror Entity are completely different cards. Good against aggressive decks, kinda good with antonidas too. I like it, decent card. It's like a better anoyatron for 5, and has the plus that it counts towards spell trigger effects, and it's split in 3 bodies, and you can play it on 4. We will see =) . In arena will be best. The only problem with this card is that the next secret that you will be playing will most likely be Mirror Image. Your opponent will (or should) play around it by playing a small insignificant minion first. It's still not horrible but like I said they can usually play around it. Seems like a really good arena card though. Nevermind my comment, I'll keep it there for humor sake, as Mihaeldx pointed out quite rudely. I misread the card. Luckily it never happens to him. So so uber!! Mirror Image isn't a secret. A defensive mage card ... more evidence of moving ice block to hall of fame?